At the end of Part 49, Allin’s mom finished her fairy tale and decided it was time to go search for her husband. It had been a couple of days since Dad headed off on his own to do whatever it is he needed to do. Leaving for days at a time was not unusual for him. Nor was it unusual that I was kept in the dark about the details. Adult stuff was always the explanation. Dad would usually come back with supplies of some sort, food or clothing or another clip of ammunition for his gun. Sometimes he would return and simply say something to Mom like, “I spoke to them,” or “They confirmed it.” When I would ask what he meant, I got the look, the one that meant, “You’re too young to understand, Allin.” While I may not have known what he was up to, Mom seemed to be working under no such limitations. Once outside of our hiding spot, she chose her route without hesitation. I tried to get more information out of her as we walked, but she remained silent. Before I could devise some clever new way to ask the same questions again in the hope of a different answer, Mom shushed me and pronounced that we were near our goal. How she knew that this grey, dreary, run-down corridor was the one we wanted, when every corridor we had trudged through looked the same, I had no idea. Sure enough, though, this one was different in that it opened up onto a huge factory floor, derelict of course. Dim white strip lighting on the ceiling provided an anemic glow that limned the tops of the great machines and rows of conveyor belts while leaving the floor in perpetual gloom. My imagination populated the shadows beneath the gargantuan machines with all sorts of incredible beasts just waiting for me to stroll by so they could grab a snack. It didn’t help to allay my fears when Mom extinguished the yellow glow of her lantern coil, leaving us to make our way across the floor in near darkness. “Mom, who lives here?” I asked in a whisper. She picked her way across the factory floor, unbothered by the poor lighting, and I moved carefully alongside her. A burst of laughter erupted somewhere in the building and I almost yipped in fright, but Mom anticipated this and placed her palm firmly over my mouth before I could give away our presence. I nodded fervently and she let go of my mouth. We made it to the far side of the floor and were heading toward a wall that had two doors set near to one another when Mom suddenly stopped. She glanced to either side and yanked me into the tight space between two large, metal contraptions. A second later there came the sound of a door opening, and a sickly yellow light spread out along the pathway we had tread a moment before. Unquiet footsteps echoed as a shadow partially eclipsed the light. The footsteps moved away and the door whined as it started to close. Mom tugged on my hand and we slunk out of our hiding spot. After a quick glance to check that no one was nearby, we crossed to the closing door and Mom held it open. She looked inside, waved me in, and came in after me, easing the door shut behind her. We were in a fairly large room with rows of tall, thin lockers with long, wooden benches in front of them. Some sort of changing room for the factory workers in days past, I guessed. The floor was covered with the garbage of ages past, that was certain, except for a mostly cleared path that led further into the room. From somewhere down that path, out of sight past the lockers, voices murmured. Mom pulled one of her knives out from its sheath on her hip and we proceeded along the path when suddenly the door behind us opened again. We turned around and saw two tough-looking guys come in. They looked surprised to see us. “Who brought the presents?” one of them asked. The other grinned and pulled a foot-long knife of his own from his belt. I did. It was a tight fit and I couldn’t move once I was inside. Mom closed the door on me and I heard her jam something through the handle. I pushed against the door and it wouldn’t budge. There were horizontal slits in it, but the ones at my eye level were angled up. All I could see out of them was the ceiling. There was a flash of white light that washed out the yellow of the ceiling lights for a moment, and then I heard curses and shouts of surprise from the men who had been taunting us. 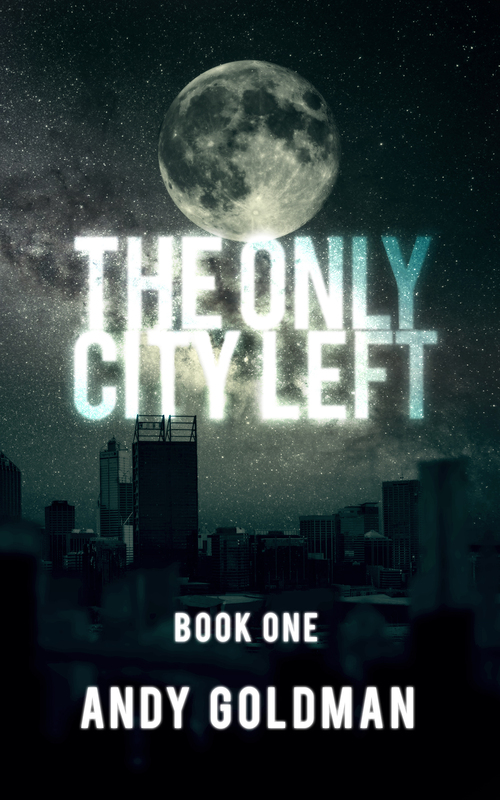 For a quick way to show support (one click; you don’t need to sign in), please vote for The Only City Left at topwebfiction.com. If you have a little more time and don’t mind registering first, I would appreciate any ratings/reviews/recommends on the Web Fiction Guide, a wonderful place to find all sorts of online fiction. You can also share The Only City Left by clicking on any of those handy social media buttons at the bottom of the page. All these methods help to bring in new readers, which is great for moral support. Thank you for reading! At the end of Part 48, Allin is remembering a fairy tale his mother told him once. In it, a princess was forced to marry a monster, who locked her up when she tried to steal his magic. Locked in darkness, the princess would surely have gone mad if not for secret and risky visits from the monster king’s younger brother. Each day, he snuck in to spend some time with her and share the light from the orb that had transformed him into a monster. Knowing that the monster king had dispatched his other brother without a second thought, the princess asked the younger brother why he risked seeing her. He lowered his head and did not answer, but it was clear that he was in love with her. In the times when he was gone and she was alone in the dark, the princess thought of him often. He was a monster and had not stopped his brother from committing countless evil acts. But where the monster king reveled in his crimes, his brother seemed ashamed of what he had become. Despite her misgivings, she slowly found herself coming to love the younger brother in return, for he was the only light in her dark world. Because of this growing love, the princess entrusted the younger brother with the secret she had kept hidden all these months: she planned to have her revenge on the monster king for his many misdeeds. At first, the younger brother tried to talk her out of her plan, not out of any love for the monster king, but out of fear for the princess. The monster king was too powerful to fight. All who had tried to knock him from his throne had perished in the attempt. The princess would have none of this, though. She would not spend the rest of her life in servitude to the monster king, not when there was any chance of escape. She asked the younger brother why the king’s magic orb had not worked for her and he explained that the orb alone did nothing. It only worked on those who had been cursed with a monster’s bite. Even then, the orbs would only work for those who know the magic words to unlock their light. The princess asked the younger brother if he knew where extra orbs were kept. As she suspected, there was a trove of them, and the younger brother reluctantly admitted that he could get her one. “Unless I, too, am cursed,” she said, and bared her neck for him. When the month was over, the princess emerged from her dark prison as the perfect picture of submissiveness. The monster king was well pleased at the effect his punishment had produced. He would brook no misbehavior from his subjects, much less his wife. She obeyed all his commands and made sure he stayed in a good mood, for she feared him becoming suspicious and punishing her again before she could put her plan into action. A few nights later, when his younger brother came to visit, the monster king was in such a boisterous state, he invited him in despite the late hour. He ordered his wife to serve them drinks while they regaled each other with stories of conquest. The princess could see how nervous the younger brother was, so she made sure to stay nearby and offer the monster king sweets and heady drinks whenever there was a lull in the conversation. The longer the younger brother could keep him talking and drinking, the better their chances of success would be. Soon, the king began to yawn and stretch his great arms above his head. The princess knew he would next demand that his brother leave so that he could sleep. The time was ripe to enact her plan. She could only trust that nerves would not prevent the younger brother from performing his part in this dark play. The princess offered the monster king one last drink, and at the same time begged him to tell a story of when he and his brother were young, for she (truly) could not imagine them at such an age. Well into his cups and feeling benevolent, the monster king readily agreed to this nostalgic request, curiously glossing over any reference to their other brother as he told his tale. While the monster king was thus engaged, the princess took a step back and produced the magic orb that the younger brother had given to her while she was in prison, which she had kept hidden until this moment. Speaking the magic words, she transformed into a foul monster and felt the great power of which the monster king oft boasted. Any doubts the younger brother had were erased upon hearing those words from the mouth of a fratricide. Both the princess and the younger brother took their revenge upon the monster king. They fatally wounded him, but before he succumbed to his many wounds he managed to call out for his guards. The princess and the younger brother were forced to flee before they could watch the monster king die, but as the princess was now a monster, too, they blended in with the other monsters and were able to escape the Garden unmolested. The End. Mom didn’t like interruptions during the telling of tales, but once the story was over, I was allowed to ask all the questions I wanted. I printed out the first complete draft of The Only City Left recently and am in the midst of doing a red-pen edit and then making those changes in the master file. It’s exciting and daunting at the same time to be in this phase of the project. I’ve also started throwing out ideas for Books 2 and 3. Fun times. At the end of Part 47, Allin is lost in memory again. This time it is of a fairy tale his mother told him once. But is there some truth hidden in this story? The princess could not believe her eyes. Gone. Everything she had known was gone. Her husband could only stand by and watch as she kneeled in the ashes of the Garden and wept. When she had cried herself out, her husband suggested that they return to his home and inquire of his brothers if they knew aught of the Garden’s fate. Numb, she let herself be led away. Upon returning to his home, however, he was astonished to find that it too had been transformed. Unlike the princess’ home, it had not been destroyed, though. Instead it had been turned into a mighty fortress that was patrolled by monstrous guards. In fact, everyone seemed to have become a monster. Seeing this, the princess and her husband sought to flee, but before they could do so, they were captured and brought before the fortress’ ruler. This turned out to be none other than her husband’s older brother, who had become the most powerful monster of them all. “Welcome home, Princess,” said the older brother. “I have no home,” she said. This only confirmed the princess’ suspicions, for who would destroy a peaceful town except for a monster? “What has become of you, brother? What madness has seized you?” said her husband. “Never,” said her husband, which was an act of defiance at once valiant and unwise, for the monster king lashed out at him and in the next instant he lay bleeding on the floor. “Dispose of him,” the monster king said to his nearest guard. The princess considered his offer carefully, for the monster king was obviously a cruel man and life with him might be worse than death. In the end, she accepted his offer, vowing to him to ever be faithful while on the inside promising to have her revenge on him. The monster king cackled in glee and pulled the princess to him. She found him repulsive but hid her true feelings behind a mask, and the monster king was pleased. Days passed and turned into months, and all the while the princess pretended to be a dutiful wife and servant to the monster king, who was either blind to the revenge that burned in her heart or did not feel threatened by it. She spent every minute of every day searching for clues as to how the older brother had become the monster king, but even though she was a princess and his bride, she was treated as the lowliest of servants and no one would speak to her of matters of import. She would have gone mad during this time if not for acts of kindness from an unexpected source: the king’s surviving brother. He had vowed to protect her if she chose him as her husband, and even though she had not, he was not angry with her. The younger brother found moments throughout each day when the monster king was away or distracted, and he used these to talk to the princess. Each of these moments became a light in her otherwise dark existence. Eventually, she convinced him to reveal to her the secrets of how he and everyone else in this new Garden had become monsters. He spoke to her of powerful beings that had visited his older brother and made a bargain. The beings, who belonged to a distant kingdom called the Fifth House, gave the older brother a magical orb that allowed him to change into a monster, and more orbs to change others as well. In return, he and everyone he transformed would owe the Fifth House a favor, to be collected at a later time. The older brother accepted this bargain and, with his new monstrous powers, forced everyone he knew to accept it as well. The younger brother explained that without the orbs, the monsters would appear human again, but that the monster king had forbid them to change back unless under his direct orders. Not everyone agreed with the monster king’s rule, but he struck such fear in everyone’s hearts that no one defied him. There was no room for fear in the princess’ heart, however, as it was already full to the brim with her plans for revenge. Armed with the knowledge shared by the younger brother, she set out to procure one of the orbs for herself, for what chance did she have to fight back against monsters unless she was as powerful as them? The orbs proved to be difficult to obtain, however. Each person who had one guarded it closely, and though the princess suspected there must be a trove of them somewhere, she was not allowed to explore the Garden on her own. One night, while the monster king slept, she risked taking his orb, which he wore on a necklace. She slipped it off his neck and he became human once more, but when she put it on, she did not change. The monster king awoke to find her wearing his treasure, and he might have killed her there and then were it not for her quick tongue. She convinced him that she was only fascinated by the beautiful light the magic orb gave off and had wanted to wear it to look more beautiful for him. He accepted this, and in his benevolence he chose not to kill her. Instead her punishment for stealing his light would be thirty days spent locked in a lightless cell. Her screams and tears as his guards carried her away pleased the monster king greatly. At the end of Part 46, Allin’s grapple gun jammed (remember the nutrient jelly in the backpack?) and instead of heroically flying up into the air and away from danger, he fell into the dark, watery abyss. Memories are funny. Some that you wish you could forget are always popping up to remind you of something stupid or embarrassing that you’ve done. Others slip through your fingers like water, and no matter how tight you grip them, they dribble away and evaporate. Sometimes, like when you’re plummeting blindly to your death amidst a deluge of water, they return. Much of my childhood seemed monotonous. I had no friends besides my parents, and the three of us were always on the move: a never-ending family hike. For Dad, this was simply The Way Things Were, and he didn’t allow me to complain about it. Mom at least recognized that for a little kid it was a dull existence. She would sometimes tell stories to pass the time, and I would hang on her every word. One time, when I was about 8 or 9 (age being a fuzzy concept in a dying city with no night and day), Dad was away on some mission of his, so on top of the normal boredom, there was the added dullness of staying locked in the same room for days on end, waiting for him to return. “Mom, tell me a story,” I asked for probably the hundredth time in half that number of hours. She sat on the floor facing the door, the lantern coil on her chest providing the only light in our cupboard-sized room. She rubbed it absentmindedly and hummed some private tune to herself, nodding her head to a beat only she could hear. She had been doing this for hours, lost in her own world, and I couldn’t take it anymore. I felt like I would burst out of my own skin if something didn’t change soon. She looked at me with her piercing blue eyes and for a moment I thought I was in trouble. Then she smiled and patted the floor next to her in invitation. I did, even if it was about a princess. Anything was better than slowly going insane while she sat humming that tune. You’ll be happy to know, this was no ordinary princess. She didn’t live in a castle, and nor were her parents the rulers of a vast kingdom. But that was okay, because the days of rulers and vast kingdoms were long past. The princess was happy to live in her own modest corner of the city, where her parents led a small but happy community in the day-to-day tasks of ensuring that everyone had enough food, water, and light to survive. It did not escape her parents’ notice that people now needed the same type of tending as the plants they grew, so they called their small community the Garden. For many years, life was simple and peaceful in the Garden, and the young princess grew to be a young woman whom many thought beautiful. Word of the princess must have spread beyond the Garden, perhaps spoken of by one of the many traders who passed through hawking their wares. One day three brothers came to the Garden to meet her. They were known to the people of the Garden by reputation only, through tales told by those same traders. So it was that the princess and her parents knew that the brothers were a disreputable bunch, rowdies, trouble-makers. The princess was none too happy to learn, then, that each brother intended to ask her hand in marriage. Her parents, however, counseled her to hear the brothers out and see what they could offer her (and by extension, them) in exchange for her hand. The oldest brother vowed to take her away from her tiny, provincial town. He promised that if she married him, she would never have to work for anything ever again. He boasted that he was strong enough that he could take whatever she wanted from those who were weaker. The middle brother vowed that if she married him, he would take her on a tour of the world that was so thrilling and far-reaching, she would never wish to return to the insignificant portion of it she once called home. The youngest brother vowed that if she married him, he could protect her from any danger, but he would need to keep her locked away in his dungeon to make sure she stayed safe. Her parents urged her to pick one of the brothers as a suitor, for they feared that the brothers would not be pleased if they were denied, and would take their displeasure out on the Garden. The princess was terribly upset that her parents were willing to trade her for the safety of their town, but she obeyed their wishes. Since she was angry with her parents, she chose the middle brother, since his promise was to take her as far as away from her town as possible. The oldest brother and the youngest brother were not pleased with her decision, but what could they do? She had chosen the middle brother and that was that. They returned to their territory, the princess said a terse goodbye to her parents, and the middle brother whisked her away on the honeymoon he had promised. It was an exciting trip, but also a sad one, for though her husband was more kind to her than she expected, she did not truly love him and he could not help but realize this. He asked if she would prefer to return to her home, and in a fit of homesickness, she said that she would very much like that. But when he brought her back to the tiny portion of the city she had once called home, they were both astonished to find that the town destroyed and its people vanished. The Garden was no more.